In this Indian name, the name Ravichandran is a patronymic, not a family name, and the person should be referred to by the given name, Ashwin. Ravichandran Ashwin ( pronunciation (help·info); born 17 September 1986) is an Indian international cricketer. A Bowler who bats right-handed and bowls right-arm off break, Ashwin plays for Tamil Nadu in domestic cricket and captains Kings XI Punjab in the Indian Premier League. He is the fastest Indian bowler (also in some records the fastest in the world) to reach the 50-, 100-, 150-, 200-, 250- and 300-wicket mark in Test cricket. In 2016, he became the third Indian to win the ICC Cricketer of the Year award. Having achieved little success as an opening batsman at junior-level cricket, Ashwin dropped down the order and turned into an off-break bowler. He made his first-class debut for Tamil Nadu in December 2006 and captained the team the following season. But it was not until the 2010 Indian Premier League in which he played for the Chennai Super Kings, that he came into the limelight with his economical bowling and earned his maiden international call-up in the limited-overs formats in June 2010. He was the leading wicket-taker and player of the tournament of the 2010 Champions League Twenty20 in South Africa. He was also part of the Indian squad that won the 2011 Cricket World Cup. Later that year, he made his Test debut against West Indies and became the seventh Indian to take a five-wicket haul on Test debut. He took two five-wicket hauls and scored a century in that series and won the player of the series award. Ashwin continued to succeed in the subcontinent but proved to be less effective in other places like Australia and England. In a home Test series against Australia in 2013, he took 29 wickets, the most by any Indian bowler in a four-match Test series. The same year, he took his 100th Test wicket in his 18th match, becoming the fastest Indian bowler to the milestone and the fastest in the world in over 80 years. In 2017, playing his 45th Test, Ashwin became the fastest player to pick up 250 Test wickets, bettering Dennis Lillee, who had achieved the landmark in 48 Tests. Ashwin is the only bowler in recent times, apart from Sri Lanka's Ajantha Mendis to bowl the carrom ball. With four centuries in his Test career so far, Ashwin has earned the reputation of being a bowling all-rounder. He was a recipient of the Arjuna Award in 2014 and the BCCI's international cricketer of the year for the 2012–13 season. He also won the ICC Cricketer of the year 2016 along with ICC Test Cricketer of the year 2016 in December 2016. Ashwin was born on 17 September 1986 in a Tamil family. He lives in West Mambalam, Chennai. He did his schooling from Padma Seshadri Bala Bhavan and St. Bede's. He attended SSN College of Engineering and graduated with a BTech in Information Technology. His father Ravichandran played cricket at the club level as a fast bowler. His career took a big turn when he shifted schools and joined St. Bede's Anglo Indian Higher Secondary School as it had a cricket academy. Ashwin states that coaches C.K.Vijay and Chandra in St Bede's had played a big role in his career and here he changed his bowling style from medium pace to off spin. Ashwin was the opening batsmen for India under 17's, before getting replaced by Rohit Sharma due to lack of form. Ashwin plays as a bowler for Tamil Nadu cricket team and South Zone. He played for Chennai Super Kings in the Indian Premier League. He was the highest wicket-taker of the 2010 Champions League Twenty20 tournament for Chennai Super Kings with 13 wickets and was adjudged as the player of the tournament. He started his career as a fast bowler. After some years, he changed into a spin bowler. On the back of his impressive performance in the 2010 Indian Premier League, Ashwin was selected in a second-string squad that toured Zimbabwe in May–June 2010. He made his ODI debut against Sri Lanka on 5 June 2010, scoring a 32–ball 38 and taking 2/50 in that match which India lost to crash out of the tri-series. His T20I debut came a week later, against Zimbabwe at Harare where he took 1/22 in four overs in an Indian win. Ashwin was selected for the tri-series against New Zealand and hosts Sri Lanka, but did not get a game with Pragyan Ojha and Ravindra Jadeja being preferred over him throughout the series. In October, the selectors decided to rest first-choice players in the three-match home ODI series against Australia, enabling Ashwin to get selected in the team again. Ashwin was the most economical bowler in the only match played in the series in which he took 1/34 in nine overs while India registered a five-wicket victory. Ashwin played in all five matches of the home series against New Zealand in November–December 2010. India completed a 5–0 whitewash and Ashwin ended up as the leading wicket-taker of the series with 11 wickets at an average of 21.90. At the conclusion of the series, Ashwin earned the praise of captain Gautam Gambhir, who called him "the find" of the series and hailed his bowling during the powerplay overs. Despite this success, Ashwin failed to make it to the playing eleven in any of the five ODIs on the South African tour, with the inclusion of lead spinner Harbhajan Singh in the team. However, Ashwin did manage to find a place in the 15-member World Cup squad that was announced during the series, with Harbhajan and Piyush Chawla being the other two specialist spinners in the squad. He played only two matches in the World Cup and made his World Cup debut in March 2011 against the West Indies with bowling figures of 2/41 in 10 overs. He bowled his full quota in the quarterfinal against Australia at Ahmedabad and picked 2/52. India went on to win the tournament, but Ashwin did not feature in either the semi-final or the final. Ashwin replaced vice-captain Harbhajan for the fourth and fifth ODI of India's tour of West Indies in June–July 2011 but picked just one wicket. Ashwin was retained in the limited-overs squad for the England tour. He emerged as India's best bowler of the series, which India lost 3–0, taking six wickets at an average of 25.16. England toured India in October 2011 and were whitewashed in the ODI series 5–0. With 10 scalps at 20.20, Ashwin was as the second highest wicket-taker of the series, only behind teammate Jadeja. In November 2011, West Indies toured India for three Tests and five ODIs. Ashwin's recent ODI success saw him being included in the Test squad for the first time. Ashwin and Ojha were the only two specialist spinners in the squad, with Harbhajan being omitted owing to his indifferent form during the England tour. Ashwin made his Test debut in the first match at Delhi, earning his cap from Sachin Tendulkar. Ashwin took 3/81 in the first innings and 6/47 in the second, helping India win the match. He was awarded the man of the match and became the third Indian player to win the award on Test debut. He picked four wickets in the second Test at Kolkata where India registered an innings victory. In the third Test at Mumbai, he took 5/156 while West Indies made a total of 590 and scored his maiden international century in India's first innings (103 runs from 118 balls) to take India's total to 482. Ashwin thus became the third Indian to score a century and take a five-wicket haul in the same Test and the first since 1962. West Indies were bowled out for 134 in their second innings as Ojha and Ashwin shared all ten wickets between them, with Ashwin picking 4/34. The match ended in a draw with the scores level, after Ashwin took a single and was dismissed run out attempting a second run off the last ball of the match. He was awarded the man of the match as well as the man of the series for his all-round performance. Ashwin featured in four matches of the subsequent ODI series and took four wickets at 49.00. Ashwin was ineffective on India's 2011/12 tour of Australia. He played in three Tests on the tour taking nine wickets at an average of more than 62. He also featured in the subsequent triangular CB Series against Australia and Sri Lanka and took seven wickets in as many matches at 43.42. In March 2012, he took five wickets in three matches of the 2012 Asia Cup in Bangladesh. He had a quiet tour of Sri Lanka in July–August 2012 taking five wickets at 39.40 in the five-match ODI series and 1/22 in the one-off T20I. Ashwin returned to form during the two-match home Test series against New Zealand. In the first Test at Hyderabad, he claimed 6/31 and 6/54 helping India seal an innings victory and was named the man of the match. His match figures of 12/85 bettered S. Venkataraghavan's 12/152 for the best figures by an Indian bowler against New Zealand in Tests. In the second match at Bangalore his efforts of 5/69 in the second innings helped India win the match and the series 2–0. He was awarded man of the series for his tally of 18 wickets at 13.11 average. Ashwin played four matches in the 2012 ICC World Twenty20 in Sri Lanka and took five wickets at an economy rate of 6 and an average of 19. During the first Test of England's tour of India in late 2012, Ashwin became the fastest Indian to record 50 wickets in Test cricket as he overhauled the milestone in his ninth game. India eventually lost the series 2–1 in which he struggled with the ball managing to take only 14 wickets in the four Tests at an average of 52.64. However, he scored 243 runs, averaging 60.75 per innings, including two fifties and finished as India's second best batsman of the series. In the three-match ODI series against Pakistan and the five-match ODI series against England, he took three wickets at 43.33 and seven wickets at 35.71 respectively. While playing for India Cements at the BCCI Corporate Trophy in February 2013, Ashwin worked with former Tamil Nadu spinner and childhood coach Sunil Subramaniam to make changes to his bowling ahead of the four-match Test series against Australia. Subramaniam and Ashwin spent a few hours every day for a week at the nets in Nagpur. Among the changes made was shortening Ashwin's bowling stride. There were a few changes I had to make after the England series [...] I had to work on my delivery stride, it had got a little long during the England series and that was affecting the way I was delivering the ball. We had very little time, but I was lucky to have a coach [Subramaniam] who identified it pretty quickly. — Ashwin on the changes he made to his bowling before the Australia series. Ashwin was highly successful on Australia's four-Test tour of India in February–March 2013. In the first Test at Chennai, his home ground, he took 7/103 and 5/95 leading India to a comfortable eight-wicket victory. He had a haul of 5/63 in the second innings of the second Test at Hyderabad where India registered an innings win. He took a total of four wickets in the Mohali Test where India sealed the series with a six-wicket victory. In the last match at Delhi, he took 5/57 and 2/55 in another Indian win which completed a 4–0 whitewash of Australia. 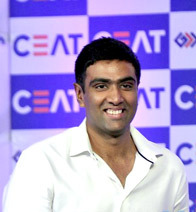 During the match, Ashwin surpassed former India captain Anil Kumble's tally of 27 wickets for most wickets by an Indian bowler in a four-Test series. Ashwin finished the series as the leading wicket-taker with a tally of 29 wickets at 20.10 and won the Man of the Series award. It was the first time India won four or more Tests in a series and the first time Australia was whitewashed since 1969–70. Ashwin also became the third Indian off-spinner to take 25-plus wickets in a series after E. A. S. Prasanna and Harbhajan Singh. Ashwin was a member of the Indian team that won the 2013 ICC Champions Trophy in England. His figures of 2/15 in four overs in the 20-overs-a-side final helped India restrict England to 124/8 and win the match by five runs. He had a total of eight wickets from five matches at an average of 22.62, conceding 4.41 runs per over, and ended as the joint-fifth highest wicket-taker of the tournament. With nine wickets in six matches, Ashwin finished as the leading wicket-taker of the home ODI series against Australia in October–November 2013 which India won 3–2. On India's tour of South Africa, Ashwin had a difficult time with the ball. He picked only one wicket across three ODIs and went wicketless in his 42 overs in the first Test at Johannesburg, following which, he lost his spot in the team to Jadeja for the second Test. In early 2014, Ashwin's overseas struggles continued during the New Zealand tour where he managed to bag a solitary wicket in the five-match ODI series which India lost 4–0. However, in the third ODI, coming in to bat with India at 146/5 in pursuit of 315, he scored his maiden ODI fifty of 65 runs from 46 balls. He shared a 38-run partnership with Dhoni and an 85-run seventh wicket stands with Jadeja, as the match eventually ended in a tie. In the two-match Test series that followed, Jadeja was preferred over Ashwin as the lone spinner in the playing eleven. Ashwin was back among the wickets when India went to Bangladesh for the 2014 Asia Cup and the 2014 ICC World Twenty20. He took nine wickets in four matches of the Asia Cup and finished as the joint-third highest wicket-taker of the tournament. He played a vital role in India's unbeaten run to the World Twenty20 final. His tally of 11 wickets in six matches at an average of 11.27 and economy rate of 5.35 put him joint-third on the list of most wickets in the tournament. Ashwin was part of the Indian team that toured England in 2014. He played his first match of the Test series only in the fourth game in which he scored 40 and 46 not out but went wicketless in an innings defeat for India. He took three wickets in the last match, which was another innings defeat. India and Ashwin found more success in the ODI series followed. With India winning the series 3–1, Ashwin took seven wickets from four matches at an average of 24.85 and economy rate of less than 4.5. India whitewashed Sri Lanka in a five-match ODI series in November 2014 in which Ashwin had 6 wickets to his name at 33.33. Debutant leg-spinner Karn Sharma was chosen over Ashwin for the first Test of India's tour of Australia in December 2014. After Sharma's indifferent debut, Ashwin returned to the playing eleven as the lone spinner and took a total of 12 wickets at an average of 48.66 in the remaining three matches. I see a lot of myself in Ashwin. He is a fantastic cricketer with a lot of work ethic. Obviously, he is a far better batsman than me. — Former India Test captain Anil Kumble on Ashwin, February 2015. Ashwin was selected to represent India for the second consecutive ODI World cup to be held in Australia-New Zealand in 2015. In the 2015 three-match series against Sri Lanka, he dismissed Kumar Sangakkara, who was retiring following the second Test, four consecutive times in his final four innings. At the end of the series, he finished with 21 wickets and in the process, broke the record for most wickets by an Indian bowler in a series against Sri Lanka. He was awarded the Man of the Series. These efforts led him to achieve the number 1 ranking in ICC Test Bowling Rankings for the year 2015 (which he retained in 2016). In November 2015, Ashwin was a star performer throughout the Freedom Trophy Test series against South Africa in India. During the course of the series, he became the fastest Indian to reach 150 wickets in Test cricket. In the third Test in Nagpur, he picked up 12 wickets for 98 runs to hand South Africa their first away series loss in nine years. His career-best figures of 7/66 in the second innings bowled the visitors out for 185 and gave India a 2–0 series win. In New Zealand's tour of India in 2016, Ashwin took 27 wickets in 3 Tests, including a career-best of 7 for 59 in an innings. In December 2016, the International Cricket Council named Ashwin the ICC Cricketer of the Year and the ICC Test Cricketer of the Year for 2016. In the process, he became the third Indian to win the Sir Garfield Sobers Trophy for the ICC Cricketer of the Year after Rahul Dravid and Sachin Tendulkar, and also the second cricketer ever after Dravid to win the two awards in the same year. Now that India tour Australia , in the first Test's second innings Ashwin bowled 52.5 overs while conceding just 92 runs and taking 3 wickets at an economy of 1.74 per over. Ashwin started his IPL career with Chennai Super Kings in 2009. He went on to win two consecutive IPL titles with Chennai Super Kings in 2010 and 2011, he picked up 13 and 20 wickets respectively in each season. After Chennai Super Kings was banned for the 2016 and 2017 season, he was drafted to Rising Pune Supergiants. In the 2016 season, Ashwin picked up his 100th wicket against Kings XI Punjab in a four-wicket victory. He missed the 2017 season due to sports hernia. On 27 January 2018, Ashwin was bought by Kings XI Punjab in the 2018 IPL Auction for ₹ 7.6 crores. On 26 February, it was announced that he would captain Kings XI Punjab.. On 25 March 2019, in a match between Rajasthan Royals and Kings XI Punjab, Ashwin was highly criticised for mankading Jos Buttler. Ashwin produces a lot of variations of the ball and flights the ball, thereby giving it more chance to spin and dip on the batsman. In addition to his normal off-breaks, he produces an arm ball and the carrom ball, the latter of which he uses frequently in the shorter formats. In IPL 2013, he bowled leg-breaks and googly as well. However, in an interview, he has stated that he refrains from bowling the doosra as it requires him to bend and straighten his arm which he finds difficult to do. [...] what struck me was his intelligence. His use of angles, length and width of the crease. Also, guessing what a batsman was likely to do. And the kind of field placing that he is comfortable with. Those are the factors that struck me immediately – that this guy not only loves bowling, he also has a fair idea of what spin actually is. For somebody who started out at 18 or 19, I thought that was a big thing [...] Here is a guy who knew what the ball is supposed to do, where this guy is expected to play and what are the plans to keep that guy in check and put pressure on that guy. He was pretty clear at 18 itself. On 13 November 2011, Ashwin married his childhood friend Prithi Narayanan. On 11 July 2015 the couple became parents of a baby girl named Akhira. Their second daughter Aadhya was born in December 2016. Tamil Nadu State Election Commission roped in Ashwin to catch the attention of citizens to create electoral awareness in which Ashwin advises voters to check whether their names are in the electoral roll and the outcome of the result is a huge hit. Ashwin is ranked number 10 among bowlers and 6 among all-rounders in Test cricket as of 2019. In his 37th Test match, Ashwin became the fastest Indian bowler and the second fastest in the world to reach 200 Test wickets after Australian spinner Clarrie Grimmett (36 matches). Ashwin was also the fastest Indian bowler and 5th fastest in the world to reach 100 Test wickets, getting to the milestone in his 18th Test match. Ashwin became the first Indian cricketer to score a century and take five wickets in the same Test match on two separate instances. He achieved this double for the first time in his third Test against West Indies in 2011 when he made 103 and took 5/156 in the first innings. He repeated the same feat in the Kolkata Test against West Indies in November 2013 where he took 2/52 in the 1st innings and 3/46 in the 2nd innings and scored 124 in India's 1st innings. This feat had only been achieved 26 times previously in world cricket, the last occasion being by Jacques Kallis in 2002. Ashwin also scored a hundred and took nine wickets when India played against West Indies at the Wankhede Stadium in 2011. Only four other India players have hit a hundred and taken five or more wickets in a match. Ashwin is the only one to do it twice. Ashwin is also the third Indian cricketer to be awarded the Man of the Match (MoM) on debut. Other Indians to have done this before him were Narendra Hirwani, Pravin Amre, R.P. Singh. Rohit Sharma and Shikhar Dhawan achieved this feat after Ashwin. Ashwin registered the second best bowling on debut by an Indian bowler with 9/128, behind Hirwani's 16-wicket world record debut performance. Ashwin became the fastest Indian to record 50 wickets in Test matches as he overhauled the milestone in his ninth game. He achieved it when he dismissed the England opener Nick Compton on 16 November 2012 during the second day of the first Test at Ahmedabad. The previous record holder was the legendary Anil Kumble, who had reached the milestone in his tenth Test. On 8 December 2012, Ashwin completed 500 runs in his 11th Test cricket match when batting against England scoring 91*. With this he shares the record of becoming the fastest player along with Australia's Jack Gregory and England's Ian Botham, who also took 11 Tests to reach the mark of completing the all-round double of 500 runs and 50 wickets. Incidentally, the quickest Indian to reach 500 runs and 50 wickets before Ashwin was Salim Durani who did so in his 14th Test. In 2013, Ashwin surpassed former India captain Anil Kumble as the leading wicket-taker for India in a four-Test series. Ashwin claimed his 28th wicket of Border-Gavaskar Trophy (2012–13) at the Feroz Shah Kotla, New Delhi. The previous record of 27 had been achieved by Kumble against Australia too, during the 2004–05 Border-Gavaskar Trophy. The 280-run partnership between Rohit Sharma and Ashwin in 2013 was India's highest in Tests for the seventh wicket, beating the unbroken 259-run partnership between VVS Laxman and MS Dhoni against South Africa at the same venue in 2010. This was also the second-highest partnership for India against West Indies for any wicket in Tests. In 2016, Ravichandran Ashwin became first Indian to take 50 T20I wickets. He is the highest wicket-taker in Twenty20 International cricket for India with 52 wickets. On 23 August 2016, Ashwin grabbed his sixth Man-of-the-Series Award, surpassing the tie by Sachin Tendulkar and Virender Sehwag, and in only his 13th Test series, and 8th series where he played every Test. On 10 October 2016, Ashwin took his 20th five-wicket haul, making him the third fastest to reach the landmark. On 27 November 2016, he completed a double of 500 runs and 50 wickets in 2016. He is the second all-rounder from India to achieve this in a single calendar year. Ashwin is highest Test wicket taker in year 2016 with 72 scalps. On 12 February 2017, with the dismissal of Mushfiqur Rahim, Ashwin became the fastest to reach 250 test wickets. In India's 2016-17 home season, Ashwin took 64 wickets in 13 Tests, becoming the highest wicket-taker for India in a single domestic season, surpassing Kapil Dev's record of 63 wickets in 10 Tests during the 1979-80 season. In the 4th and final Test match against Australia national cricket team at Dharamshala Cricket Stadium, March 2017, Ashwin dismissed Steve Smith (cricketer) and took his wickets' tally to 79. This is the most number of wickets by a bowler in a home season surpassing Dale Steyn's record of 78 in 2007-08. In November 2015, he became fastest Indian to 150 wickets as well during his 5 wicket haul against South Africa at Mohali. In September 2016, he became the fastest Indian and second overall to get 200 wickets by dismissing Kane Williamson in India's 500th test match. On 27 November 2017, during the second Test against Sri Lanka, Ashwin became the fastest bowler to reach 300 Test wickets in his 54th Test. His 300th victim was Sri Lankan tail-ender batsman Lahiru Gamage. India won the match by an innings margin along with the milestone. The previous record holder was Australian fast bowling legend Dennis Lillee who had reached the milestone in 56 Test matches way back in 1981. ^ "Records / Test matches / Bowling records / Fastest to 50 wickets". ESPNcricinfo. Retrieved 2 July 2015. ^ a b "R Ashwin second-fastest to 200 Test wickets". ESPNcricinfo. 25 September 2016. Retrieved 25 September 2016. ^ "India v Bangladesh: R Ashwin becomes fastest to 250 Test wickets". The Times of India. Retrieved 12 February 2017. ^ Mohan, Sai (28 April 2011). "(28 April 2011) – Interview with R.Ashwin's parents". Mid-Day. Retrieved 30 March 2013. ^ "R Ashwin and the spin evolution". Forbes India. Retrieved 14 February 2016. ^ "Ashwin's off-beat story: Failed opening batsman to India's spin hope". The Indian Express. 15 April 2010. Retrieved 14 December 2012. ^ "Right turn". Atreyo Mukhopadhyay. Hindustan Times. 15 February 2011. Retrieved 22 June 2018. ^ "How the four Ts built cricketing careers". T S Manohar. The Hindu. 19 October 2017. Retrieved 22 June 2018. ^ "For Ashwin, it's all in the mind". Bagawati Prasad. The Times of India. 28 November 2017. Retrieved 22 June 2018. ^ "St.Bede's felicitates cricketer and alumni, R. Ashwin". Mylapore Times. Retrieved 22 June 2018. ^ "Zimbabwe Triangular Series, 5th Match: India v Sri Lanka at Harare, Jun 5, 2010". ESPNcricinfo. Retrieved 3 July 2015. ^ "Sri Lanka Triangular Series, 2010 / India Squad / Players". ESPNcricinfo. Retrieved 3 July 2015. ^ "Australia tour of India [Sep–Oct 2010], 2nd ODI: India v Australia at Visakhapatnam, Oct 20, 2010". ESPNcricinfo. Retrieved 3 July 2015. ^ "Records / New Zealand in India ODI Series, 2010/11 / Most wickets". ESPNcricinfo. Retrieved 3 July 2015. ^ "Gambhir praises Ashwin, team after series sweep". ESPNcricinfo. Retrieved 3 July 2015. ^ "India in South Africa ODI Series, 2010/11 / India One-Day Squad / Players". ESPNcricinfo. Retrieved 3 July 2015. ^ "No Rohit Sharma in World Cup squad". ESPNcricinfo. Retrieved 3 July 2015. ^ "Records / NatWest Series [India in England], 2011 / Most wickets". ESPNcricinfo. Retrieved 11 July 2015. ^ "Records / England in India ODI Series, 2011/12 / Most wickets". ESPNcricinfo. Retrieved 11 July 2015. ^ "Dhoni non-committal about Ashwin's in Test squad". NDTV. Retrieved 14 July 2015. ^ "West Indies tour of India, 1st Test: India v West Indies at Delhi, Nov 6–9, 2011". ESPNcricinfo. Retrieved 14 July 2015. ^ "The Kotla encore". ESPNcricinfo. Retrieved 14 July 2015. ^ "West Indies tour of India, 2nd Test: India v West Indies at Kolkata, Nov 14–17, 2011". ESPNcricinfo. Retrieved 14 July 2015. ^ "Match fizzles after Ashwin century". ESPNcricinfo. Retrieved 14 July 2015. ^ "Only the second draw with scores level". ESPNcricinfo. Retrieved 14 July 2015. ^ "Records / West Indies in India ODI Series, 2011/12 / Most wickets". ESPNcricinfo. Retrieved 14 July 2015. ^ "Records / Border-Gavaskar Trophy, 2011/12 – India / Batting and bowling averages". ESPNcricinfo. Retrieved 12 August 2015. ^ "Records / India in Sri Lanka ODI Series, 2012 / Most wickets". ESPNcricinfo. Retrieved 12 August 2015. ^ "New Zealand tour of India, 1st Test: India v New Zealand at Hyderabad (Deccan), Aug 23–26, 2012". ESPNcricinfo. Retrieved 12 August 2015. ^ "Ashwin spins India to innings win". ESPNcricinfo. Retrieved 12 August 2015. ^ "New Zealand tour of India, 2nd Test: India v New Zealand at Bangalore, Aug 31 – Sep 3, 2012". ESPNcricinfo. Retrieved 12 August 2015. ^ "Records / New Zealand in India Test Series, 2012 / Most wickets". ESPNcricinfo. Retrieved 12 August 2015. ^ "ICC World Twenty20, 2012/13 / Records / Most wickets". ESPNcricinfo. Retrieved 12 August 2015. ^ "England slump after Pujara double ton". ESPNcricinfo. Retrieved 13 August 2015. ^ "Records / England in India Test Series, 2012/13 – India / Batting and bowling averages". ESPNcricinfo. Retrieved 13 August 2015. ^ "Records / Pakistan in India ODI Series, 2012/13 / Most wickets". ESPNcricinfo. Retrieved 15 August 2015. ^ "Records / England in India ODI Series, 2012/13 / Most wickets". ESPNcricinfo. Retrieved 15 August 2015. ^ a b "'Kick on the backside' helped Ashwin deliver". Wisden India. Retrieved 26 November 2015. ^ "Australia tour of India, 1st Test: India v Australia at Chennai, Feb 22–26, 2013". ESPNcricinfo. Retrieved 15 August 2015. ^ "R Ashwin sets Indian record for wickets in a four-Test series". CNN-IBN. Retrieved 15 August 2015. ^ "Border-Gavaskar Trophy, 2012/13 / Records / Most wickets". ESPNcricinfo. Retrieved 15 August 2015. ^ "Toss no advantage for Australia". ESPNcricinfo. Retrieved 15 August 2015. ^ "ICC Champions Trophy, Final: England v India at Birmingham, Jun 23, 2013". ESPNcricinfo. Retrieved 15 August 2015. ^ "Records / ICC Champions Trophy, 2013 / Most wickets". ESPNcricinfo. Retrieved 15 August 2015. ^ "Records / Australia in India ODI Series, 2013/14 / Most wickets". ESPNcricinfo. Retrieved 23 August 2015. ^ "Records / India in New Zealand ODI Series, 2013/14 / Most wickets". ESPNcricinfo. Retrieved 23 August 2015. ^ "India tour of New Zealand, 3rd ODI: New Zealand v India at Auckland, Jan 25, 2014". ESPNcricinfo. Retrieved 23 August 2015. ^ "Asia Cup, 2013/14 / Records / Most wickets". ESPNcricinfo. Retrieved 23 August 2015. ^ "World T20, 2013/14 / Records / Most wickets". ESPNcricinfo. Retrieved 23 August 2015. ^ "India in England ODI Series, 2014 / Records / Most wickets". ESPNcricinfo. Retrieved 25 September 2015. ^ "Records / Sri Lanka in India ODI Series, 2014/15 / Most wickets". ESPNcricinfo. Retrieved 25 September 2015. ^ "Border-Gavaskar Trophy, 2014/15 / Records / Most wickets". ESPNcricinfo. Retrieved 1 November 2015. ^ "I see a lot of myself in Ravichandran Ashwin: Anil Kumble". Zee News. Retrieved 1 November 2015. ^ Jayaraman, Shiva. "All 60 wickets to India bowlers, and a rare comeback". ESPNcricinfo. Retrieved 1 September 2015. ^ Jayaraman, Shiva (6 November 2015). "Ashwin becomes fastest Indian to 150 Test wickets". ESPNcricinfo. Retrieved 30 November 2015. ^ "India v New Zealand, 3rd Test, Indore: 153 wickets and counting, R Ashwin a colossus at home". ^ "Ashwin wins Sir Garfield Sobers Trophy for ICC Cricketer of the Year 2016". International Cricket Council. 22 December 2016. Retrieved 19 January 2017. ^ "Double delight for Ravichandran Ashwin at ICC Awards". The Indian Express. 22 December 2016. Retrieved 19 January 2017. ^ "Cricket scorecard - RPS vs KXIP, Rising Pune Supergiant vs Kings XI Punjab, 53rd Match, Indian Premier League, 2016". Cricbuzz. Retrieved 2018-02-26. ^ "Ravichandran Ashwin ruled out of Indian Premier League 2017". India Today. 2017-03-31. Retrieved 2018-02-26. ^ "IPL Auction 2018: Complete Squad of Kings XI Punjab - Times of India". The Times of India. Retrieved 2018-02-26. ^ "It's Official: Ashwin named King of Kings". Kings XI Punjab. Retrieved 2018-02-26. ^ ESPN Cricinfo. "Drama in Jaipur as Jos Buttler mankaded by R Ashwin". Retrieved 28 March 2019. ^ Chennai Super Kings v Sunrisers Hyderabad, IPL 2013, Chennai: R Ashwin the legspinner, and Steyn's spot | Cricket Features | Indian Premier League. ESPNcricinfo. Retrieved 23 December 2013. ^ Ravichandran Ashwin On Innovation. YouTube (20 February 2012). Retrieved 23 December 2013. ^ "Transcript: Couch Talk with Sunil Subramaniam". The Cricket Couch. Retrieved 26 November 2015. ^ "Ravichandran Ashwin to marry Sunday". Sify.com. 9 November 2011. Retrieved 30 March 2013. ^ "Why Ravichandran Ashwin's wife announced birth of 2nd 'carrom' baby five days after delivery". Firstpost. 27 December 2016. Retrieved 23 December 2017. ^ "EC tweet featuring Ashwin a big hit". 26 February 2016. Retrieved 1 August 2016 – via The Hindu. ^ ICC Player Rankings. ESPN Cricinfo. Retrieved on 22 December 2016. ^ "All-round records". Retrieved 27 November 2011. ^ a b "Ravichandran Ashwin first Indian to take 50 T20I wickets – India Today". ^ Ashwin surpasses Tendulkar, Sehwag. Cricket.com.au (23 August 2016). Retrieved on 2016-12-22. ^ "Ashwin registers 20 five-wicket hauls in record time". ESPN Cricinfo. Retrieved 11 October 2016. ^ "R Ashwin emulates Kapil Dev's all-round feat". ESPN Cricinfo. Retrieved 28 November 2016. ^ "Ashwin - the fastest to 250 Test wickets". ESPN Cricinfo. Retrieved 12 February 2017. ^ "Ashwin's race to 250 Test wickets". ESPN Cricinfo. Retrieved 12 February 2017. ^ "India vs Australia 2017: R Ashwin breaks Kapil Dev's record of most wickets in home. Also broke Dale steyn's (78)record of most wicket in a test season". The Indian Express. 24 February 2017. Retrieved 24 February 2017. ^ "Fastest to take 25 five wicket hauls". cricinfo. ^ "Fastest to take 25 five wicket hauls". news18.com. ^ "Jadeja-Ashwin first pair of spinners to be jointly ranked world no 1". cricinfo. ^ "R Ashwin breaks Dale Steyn's record of most wickets in a Test season". The Indian Express. 2017-03-25. Retrieved 2017-03-26. ^ "Most test wickets in a home test season". cricinfo. ^ Jayaraman, Shiva. "Ashwin the fastest to 100 Test wickets in over 80 years". ESPNcricinfo. Retrieved 2 July 2015. ^ "India vs New Zealand 2016: Ravichandran Ashwin second fastest in Test history to 200 wickets – Times of India". Retrieved 25 September 2016. ^ "Test cricket bowling records for fastest to 300 wickets". Retrieved 27 November 2017. ^ "2nd Test, Sri Lanka tour of India at Nagpur, Nov 24-28 2017". Retrieved 27 November 2017. ^ "Ravichandran Ashwin breaks Dennis Lillee's record of fastest 300 Test wickets". economictimes.indiatimes.com. ^ "ICC Awards: R Ashwin wins Cricketer of the Year award". Times of India. December 23, 2016. Retrieved February 13, 2017. ^ "R Ashwin receives Sir Garfield Sobers trophy". @businessline. Retrieved 29 March 2018. Wikimedia Commons has media related to Ravichandran Ashwin. Praveen Kumar was injured and replaced by Sreesanth.